A hyper-kinetic blood and guts crime drama on the scale of an overblown opera, the 1983 version of Scarface is film making driven by sheer verve. Director Brian De Palma and writer Oliver Stone combine to knock-down all the barriers, with an intentional excess of foul language, violence, drug use, and ultimately, the steepest rise and most stomach-churning descent for a brutal gangster providing a reminder that crime does not pay. When Fidel Castro empties his jails and ships off his prisoners to the United States, hoodlum Tony Montana (Al Pacino) washes up in Florida with his friend Manny (Steven Bauer). Ambitious and thirsty for riches, Tony is quickly involved in crime, proving himself to local henchman Omar (F. Murray Abraham) by murdering an ex-communist and then disposing of violent Colombian drug runners when a deal goes bad. Tony and Manny earn employment with Omar's boss, crime lord Frank Lopez (Robert Loggia), and Tony immediately sets his eyes on Frank's wife Elvira (Michelle Pfeiffer), a coke-snorting blonde beauty. Tony's crime-derived wealth does not sit well with his mother, but his sister Gina (Mary Elizabeth Mastrantonio) is drawn into his sordid circle. Not satisfied with playing second fiddle to anyone, Tony starts to work his own contacts, eventually striking a deal with powerful Bolivian drug producer Alejandro Sosa (Paul Shenar), causing stress in his relationship with Frank. When Tony finally makes it to a life of incredible wealth at the top of the Miami crime world, it is just a prelude to a rapid downward journey. Al Pacino delivers one of the performances of his career as Tony Montana, a man smart enough to make his way to the pinnacle of the underworld and dumb enough to throw it all away with remarkable haste. But even Montana is able to recognize the void at the top, Scarface spending quite a bit of time with Montana lamenting the emptiness of everything he fought to achieve. Elvira is beautiful but nothing more than a drug addict, their mansion is gold-plated but contains no love, and the endless amounts of drugs and money produce no true happiness. Once Montana discovers that his dream destination contains no satisfaction, his hastened downfall is almost an act of intentional self-destruction in pursuit of relief. Michelle Pfeiffer creates ice on the edges of the screen, Elvira captivated by her own beauty and so detached and continuously bored that nothing engages her other than wasting away on the next snort of cocaine. Despite trying to pretend that Tony is beneath her, they are actually made for each other, a couple headed to the same burnout along different paths. Robert Loggia is larger than life as the established crime lord Frank, a man almost too comfortable at the top of his heap of crime. Steven Bauer oozes charisma as the one person who has some influence on Tony, a relatively rational friend whose advice often goes unheeded. Mary Elizabeth Mastrantonio rounds out the cast as Gina, the younger sister easily sucked into the vortex of sleaze, despite starting as a small island of purity for Tony's soul. Scarface has one of the most profanity-filled scripts in the history of the movies, Montana using the F-word in almost every sentence. Stone and De Palma also ratchet up the violence to new levels of blood-drenched gruesomeness, a chainsaw dismemberment in the bathtub and a hanging from a helicopter just some of the methods used by merciless gangsters pursuing control of the drug trade. The Scarface locations are memorable for their opulence, and include Frank's sleek white-dominated apartment, Sosa's tropical oasis, the mirror-filled Babylon Club, and finally Tony's mansion, featuring a grand curved double staircase, and a black-painted office matching the colour of Tony's heart. Giorgio Moroder's smooth, synthesizer-driven music score juices the action. 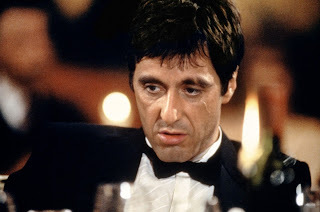 Scarface ends with a crescendo of stylized violence rarely matched on the screen before or since, as Montana, fuelled by a mountain of cocaine, has to defend his gaudy mansion against a marauding army of enemies intent on dethroning him. It's an epic 10 minutes of unrelenting intensity, with enough bullets, blood and explosions to populate a war zone, highlighted by Pacino lustily delivering the movie's famous "Say hello to my little friend!" line as he introduces his foes to a machine gun equipped with a grenade launcher. Montana may be vastly outnumbered, but he will never be outmatched. That criminals are doomed and a life of crime at best provides temporary and hollow pleasures are not new lessons. 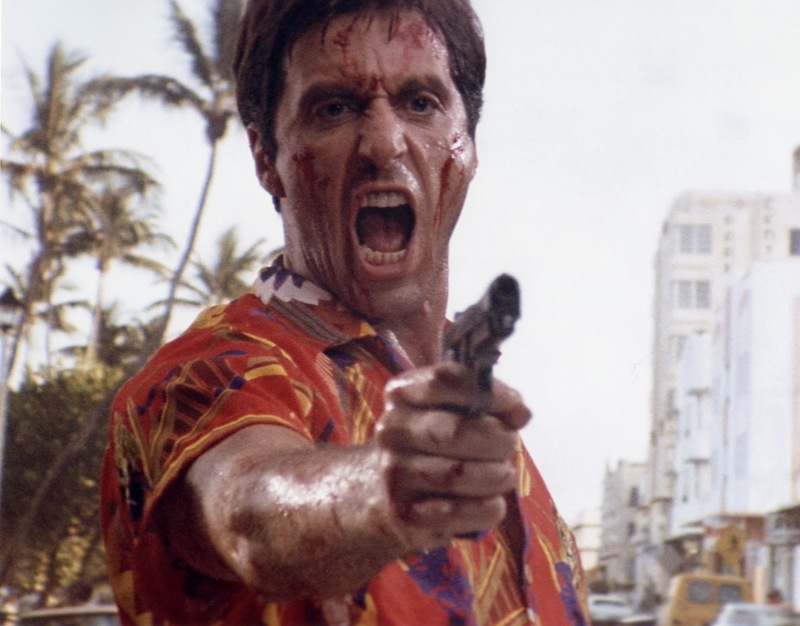 Scarface just re-states old realities with monstrously enjoyable exuberance.